The grand basset griffon Vendeen and the Nederlandse kooikerhondje make their debuts at the Westminster Kennel Club dog show. NEW YORK (AP) — Two new breeds. Sixteen new syllables. 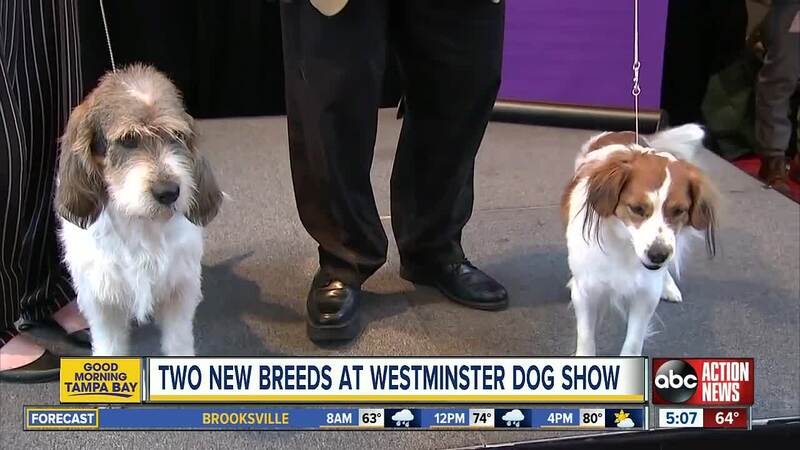 The grand basset griffon Vendeen and the Nederlandse kooikerhondje make their debuts at the Westminster Kennel Club dog show, each getting a nationally televised turn among the more than 200 breeds and varieties on the green carpet at the nation’s premier canine contest. But Buzz Lightyear, for one, seems to be taking his breed’s big moment in stride. The 4-year-old grand basset griffon Vendeen (pronounced grahnd bah-SAY’ grih-FAHN’ vahn-DAY’-ahn) glanced out at the cameras at last month's Westminster-preview news conference, looked up at owner Brielly Cipriotti, and then lay down on rostrum to do a couple of the things his breed does best: sniff around and induce smiles. “They’re extremely sweet, and they have a big, goofy attitude,” Cipriotti, of Bealeton, Virginia, said later. She’s excited about the exposure that the breed — a low-slung, long-eared, hardy hound developed in France to hunt rabbits and hare — stands to gain from Westminster. About 3,200 dogs, ranging from wee Malteses to strapping mastiffs, are entered to compete at the show, which includes agility and obedience competitions along with the breed judging that leads to the signature Best in Show trophy. It will be awarded February 12 at Madison Square Garden and live on FS1. The relatively new agility and obedience contests are open to mixed-breed dogs. Dobby, a corgi-terrier mix, is making his fourth try at the agility title. But even if he wins, it won’t be the most eventful thing that has happened at Westminster for owner Stefanie Kappus. Her husband, Toby, proposed to her as she came out of the agility ring last year. “He keeps saying, ‘What am I going to do to top that this year?’” joked Kappus, of Milford, New Jersey. New breeds appear at Westminster after getting recognized by the American Kennel Club. The process takes years and includes setting standards and having hundreds of dogs spread around the country. The merry, clever Nederlandse kooikerhondje (pronounced NAY’-dehr-lahn-seh KOY’-kehr-hahnd-jeh) was initially trained to help Dutch duck hunters by attracting the birds’ interest and then luring them into net-covered canals. “It’s the Pied Piper of the dog world,” said owner Rod Beckstead, of Jim Thorpe, Pennsylvania, as he showed off 2-year-old Bandit. The breed remains versatile and easy to teach to do dog sports and other things; some even serve as cadaver dogs, he said. Westminster is regularly protested by animal-rights activists who deplore dog breeding as appearance-focused and detrimental to mixed-breed dogs that need homes. The club portrays the show as a tribute to all canines.